What TVL/BBC has done is to reproduce the same letter, complete with same content, in two different months. This means that the 30,840 figure in the September letter is untrue. The figure may also be untrue in the April letter. It may be the case that TVL/BBC does not think that the figures matter; any old figure will do. But it does matter, because Mr Hales is purporting to be making a statement of fact. 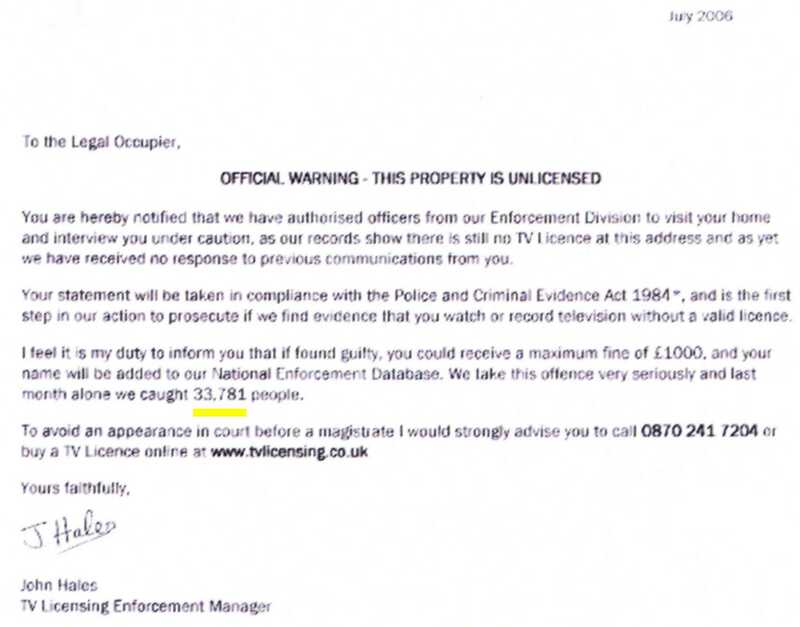 The letters are not from John Hales, but from one Sarah Armstrong, signifying that lying to the public is not confined to one individual but is practiced across the BBC. Some people regard the BBC's use of bogus detection figures as humourous; I do not agree. If a chief constable claimed detection rates which he knew to be false, it would be a resigning matter. If a private company used fake sales figures to encourage sales, it would be a breach of trading standards law. made clear that we regard any deception or breach of faith with our audiences as being utterly unacceptable" (link). Yet, the BBC lies to non-viewers every month. 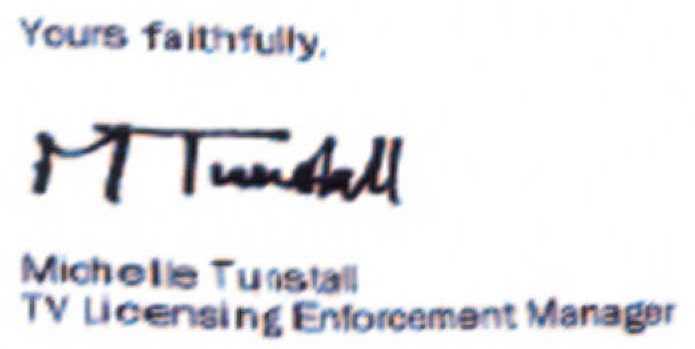 While on the subject of falsified signatures, here are two from Michelle Tunstall, dated September 2004 (left) and March 2008. "I'd like to reassure your readers that we have no wish to trouble people who genuinely do not require a TV licence. It is, however, our duty to enforce the law on behalf of the honest majority who pay the TV licence. 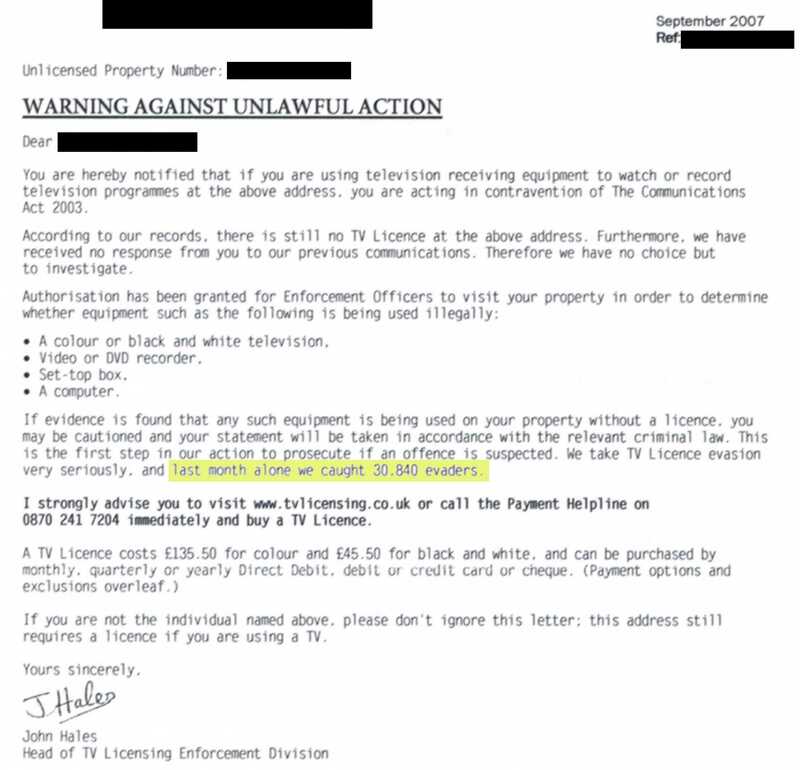 Unfortunately, if a licence is required, some people will only buy one when warned of the consequences of being unlicensed. 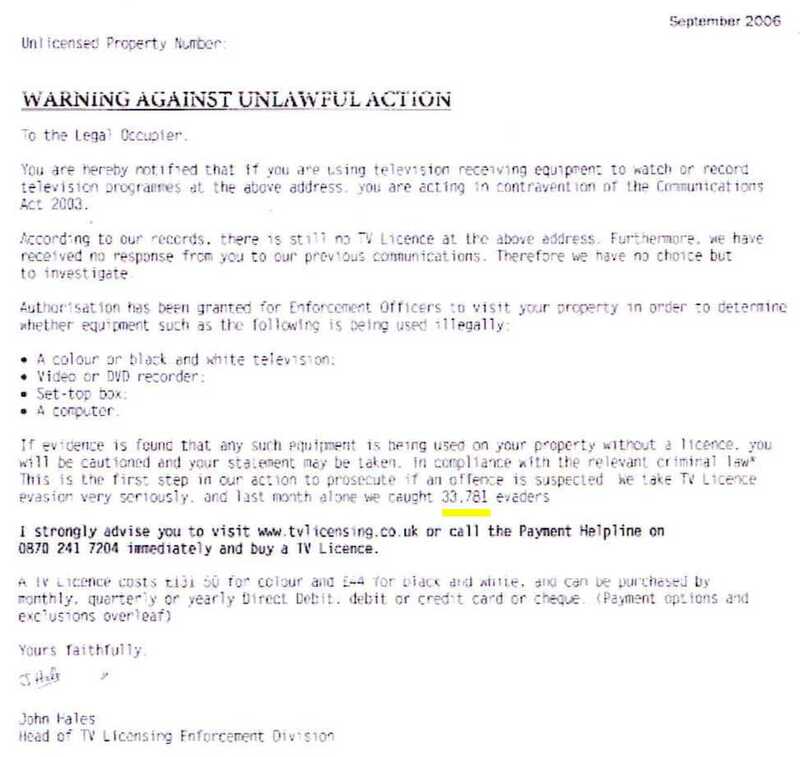 It is for this reason that some of our mailings contain messages that are designed to deter a possible evader. However, we don't presume that everyone is guilty of committing an offence, and we do try to ensure that non-viewers are not overly troubled by our inquiries. We would, therefore, urge Robert Bell or his mother to contact us on 0844 800 5870 if she is still receiving incorrect mailing so our records can be kept as up to date as possible, minimising future contact with her. 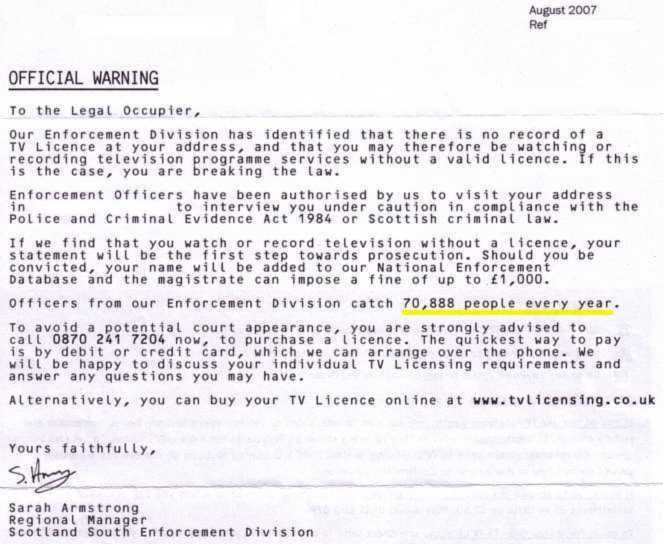 Fergus Reid, TV Licensing, 226 West George Street, Glasgow"
Aside from the disingenuous use of language, the letter has two points worthy of comment. 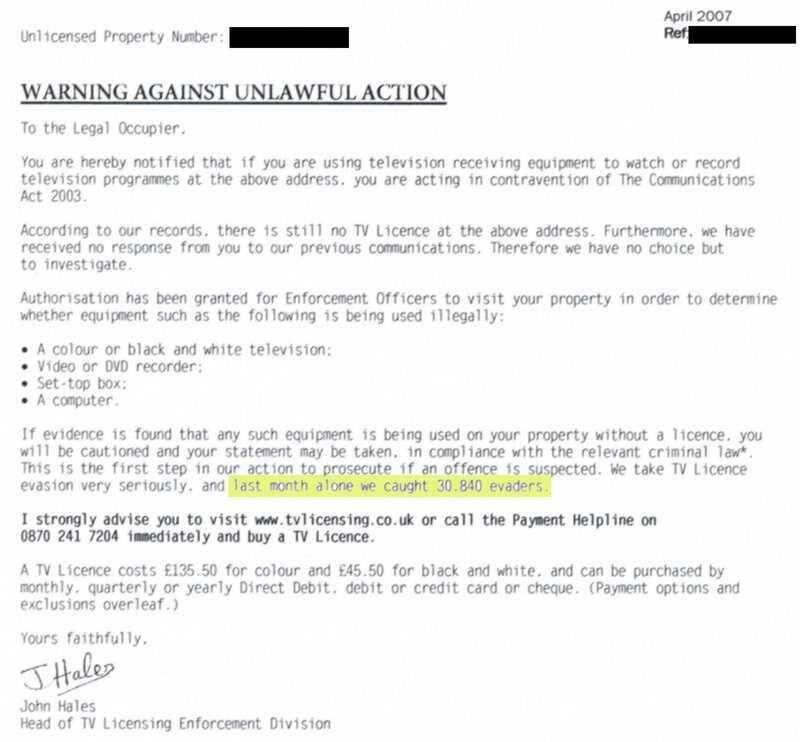 First, the address 226 West George Street, Glasgow does not come down to "TV Licensing" or the BBC. A search on Google shows that many companies use this address, so it appears to be a relay address. 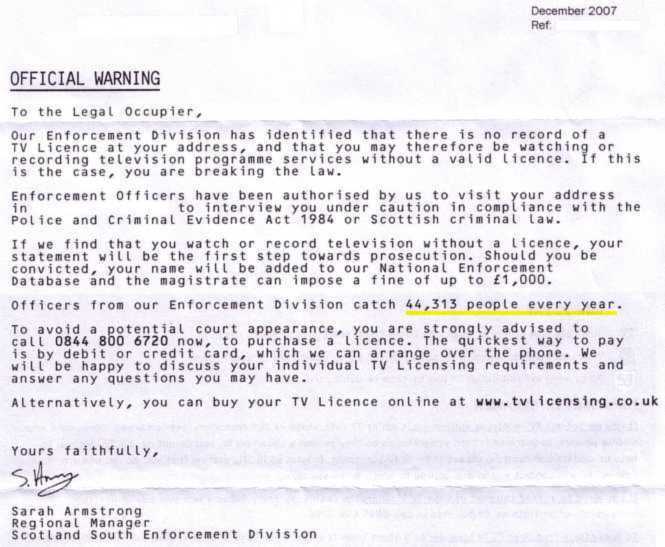 Second, the letter "urges" contact via an 0844 number, designed to create revenue for the BBC. In response to criticism in May 2008, a TVL/BBC spokesman said: "If we provided free phone calls, less money would go to BBC programmes and services". In other words, people who do not need a licence are instead expected to provide the BBC with money via premium phone lines.